Federal health reform has spawned its share of data analysis, but a new interactive infographic from the consumer finance Web site ValuePenguin allows a community-level view. It enables you to look at your own county and see the percentage of the population who are uninsured, costs of coverage under the Affordable Care Act, and how many companies are offering plans on the exchange. Data for the tool come from the Census, HealthCare.gov and state insurance exchanges. Register Now for Capital Link's Upcoming Webinars on 12/4 & 12/11! Capital Link is continuing our series of webinars for Health Centers and Primary Care Associations! Our webinars have no charge, but participation is limited to the first 100 registrants. Register today! Contact Crystal Chappell at cchappell@caplink.org or 617-988-2214 with any questions. Click here to register for 12/4 webinar! Click here to register for 12/11 webinar! Complete descriptions of our webinars are on our website here. We hope you will join us! Capital Link and Community Health Center Capital Fund (Capital Fund) announce the release of Community Health Center Financial Perspectives, Financial and Operational Ratios and Trends, 2008-2011: A Guide for Community Health Centers, the first in a series of field-building resources sponsored by the Citi Foundation. 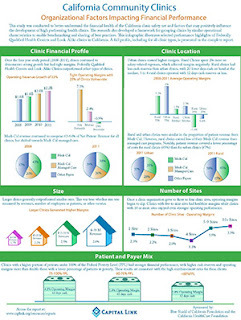 This analysis was completed to provide insight into multi-year financial trends for health centers on a national basis, critically important at a time when Federally Qualified Health Centers are expected to grow from serving over 22 million patients currently to 40 million patients over the next several years. In order to effectively manage this growth, health centers need to be able to benchmark their financial and operational performance to peer organizations. Without easily available comparative data, it has been difficult for health center leaders to identify and adopt best practices—an essential activity as health centers seek to thrive in the highly-competitive health care world. Key findings are illustrated in our infographic. The complete resource document containing detailed financial and operational data is available at www.caplink.org/resources/reports. At NACHC’s August Community Health Institute, Jim Macrae, Associate Administrator for Primary Health Care, Health Resources and Services Administration, suggested that health centers consider hiring veterans as their outreach and enrollment staff. As of September 2013 there are an estimated 22 million veterans across the country. Data on the veteran population by county as well as by congressional district is available at the Department of Veteran Affairs website: http://www.va.gov/vetdata/veteran_population.asp. To conduct outreach to veterans start with Veterans Service Organizations, a directory of which is at this link: http://www.va.gov/vso/. Capital Link announces the release of a comprehensive report sponsored by Blue Shield of California Foundation and the California HealthCare Foundation. The study was conducted to better understand the financial health of the California clinic safety net and factors that may positively influence the development of high performing health clinics. The research also developed a framework for grouping clinics by similar operational characteristics to enable benchmarking and sharing of best practices. Community clinics, which serve California’s underserved, have been consistently growing in terms of patient utilization, revenue, and number of sites operated per clinic. Many clinics continue to struggle financially despite the growth. The report, which provides a profile of clinics’ financial health between 2008 and 2011, concluded that several factors were important determinants of a clinic's financial and operational performance. Click here for our infographic, which contains selected highlights of the study. Click here to download the complete report from Capital Link's website. Click here to download an issue brief from Blue Shield of California Foundation. The nation's network of over 1,200 Community Health Centers offers a successful model for health care delivery that result in both improved patient access and significant local economic returns. 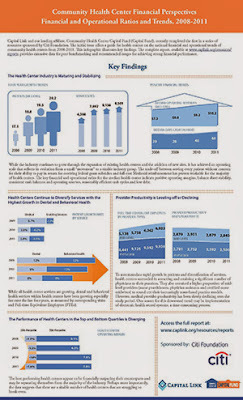 In a new article by Capital Link in Communities & Banking magazine and an infographic available here, we report that health centers have collectively generated more than $23.4 billion in total economic activity for their local communities—an increase of 17.5 percent since 2009. The analysis shows that health center growth benefits communities in multiple ways. Not only are health centers expanding access to care, they are stimulating the economy of their neighborhoods by building or renovating facilities in underserved areas, often with the benefit of adding employees. Economic benefits result from the capital investment itself, from the growth of the health center’s operations and by attracting other development projects like pharmacies, banking facilities and retail upgrades. Health centers also purchase goods and services from local businesses, creating a ripple effect of additional economic stimulus throughout the broader community. Several New England health centers, profiled in the article, are excellent examples of how health centers offer quality care and stimulate the economy. Health centers are an essential component of health care reform not only as a source of primary health care but also as source of information about new health insurance options. The Affordable Care Act requires most Americans to have health insurance beginning January 1, 2014, imposing financial penalties (fees) on individuals who do not have coverage at that time. As the enrollment window approaches, health centers have an opportunity to offer valuable guidance to their communities about the options available and the process of signing up for insurance. The latest issue of Capital Ink, Capital Link’s e-newsletter, contains an article about how health centers can help patients adjust to the health insurance changes brought by ACA implementation. Access it here. From August 11-17, health centers across the U.S. are celebrating National Health Center Week (NHCW) 2013, a campaign to raise awareness about the mission and accomplishments of America’s health centers as local solutions for affordable and accessible health care. More than 1,000 events are scheduled. In celebration of this event, Capital Link released a new infographic showing the economic impact and job growth of health centers nationally. Download the PDF from our website to share with local media, community supporters, or on social media. 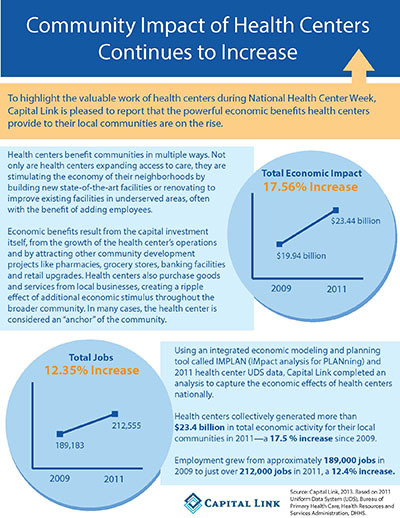 To highlight the valuable work of health centers during National Health Center Week 2013, Capital Link is pleased to report that the powerful economic benefits health centers provide to their local communities are on the rise. 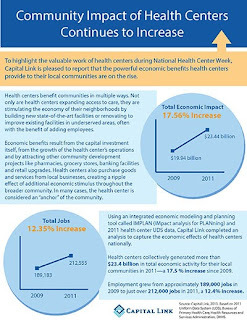 Check out Capital Link's new infographic showing the economic impact and job growth of health centers nationally. Download the PDF from our website to share with local media, community supporters, or on social media. The President’s budget includes a windfall increase for the New Markets Tax Credit program with a request for a two-year cycle. This increase would provide up to $8.5 billion in tax credit allocation for a two-year cycle 2014 and 2015. That is a total $5 billion increase over the presently proposed $3.5 billion single-year cycle. The application cycle for this improvement is in process now and applicants are looking for health center projects to include. The combining of two years’ worth of appropriation represents a large but fleeting window to finance your upcoming capital project with New Markets Tax Credits, which can provide approximately 20% of the value of project costs in the form of, effectively, a loan which is not repaid. We will not see another funding opportunity like this for two years. Capital Link is working to ensure that health centers are lined up with potential NMTC allocatees and prepared with financeable business plans prior to the announcement. Once the announcement is made, allocation will be allotted to eligible projects very quickly, so health centers should prepare now. Step 1: Complete the short questionnaire, including your contact information, health center name, brief project description with cost estimates, and project address including zip code so Capital Link can help you determine if your project is eligible for tax credit investment. To learn if your project is eligible, please submit the survey as soon as possible. Step 2: Contact Mark Lurtz at mlurtz@caplink.org or 636-244-3082 with any questions or to provide additional information about your project. In 2000, Congress passed legislation creating a new economic development tax credit program called New Markets Tax Credits (NMTC). This tax credit was designed to stimulate private investment in low-income communities. The program is administered by the Community Development Financial Institutions (CDFI) Fund under the US Department of the Treasury. Through a series of competitive application cycles, the CDFI Fund allocates tax credits to Community Development Entities (CDEs). As organizations focused on providing financing in economically-distressed areas, CDEs work to attract investors (primarily banks and large corporations), who provide them with capital in exchange for federal tax credits. The CDEs, in turn, lend or invest this capital and other loans in businesses located in targeted census tracts to spur economic growth. Because the service areas of many federally qualified health centers (FQHCs) overlap these specific census tracts, health centers can often qualify to utilize NMTC investments as part of their capital financing. NMTC transactions typically provide below-market, interest-only loans during the seven-year tax credit period; most transactions are also structured so that all or a portion of the original investment amount can become equity to the health center at the end of year seven—in effect, the NMTC portion of the investment does not need to be repaid. If you’d like more information about the program, visit our website for our publication “Spotlight on Capital Resources: New Markets Tax Credits,” available as a free download to health centers and PCAs. On June 21, the National Association of Community Health Centers announced the release of a brief entitled Quality of Care in Community Health Centers and Factors Associated with Performance by the Kaiser Commission on Medicaid and the Uninsured in collaboration with George Washington University. The brief indicates most Community Health Centers meet or exceed national benchmarks on key quality indicators. Using data from the 2010 Uniform Data System (UDS) reported by health centers and the 2008 Healthcare Effectiveness Data and Information Set (HEDIS) for Medicaid managed care organizations (MCOs), the study highlights how health centers meet or exceed high-performance benchmarks set by MCOs, which also serve low-income populations, for three quality of care measures—diabetes control, blood pressure control, and receipt of a Pap test. The study also identifies factors that differ significantly between health centers with “high-performing” and “low performing” Medicaid MCO HEDIS rates. The press release and link to the brief is available here. On May 29th, America’s Health Rankings announced the availability of a new report on the health of senior citizens, using the same state-by-state rankings released each year for the general population. The web-based report draws from BRFSS data (the Behavioral Risk Factor Surveillance System), and delivers maps that demonstrate how the senior populations are faring in each state along health indicators including diabetes, obesity, and physical activity. While Minnesota is the 5th healthiest state for the general population, its senior population is the healthiest in the nation. The state of Mississippi is in last place for both populations. This week, the U.S. Department of the Treasury’s Community Development Financial Institutions Fund (CDFI Fund) announced $3.5 billion in New Markets Tax Credit (NMTC) awards nationwide. 85 organizations were awarded with tax credit allocation authority under the tenth award round of the NMTC Program. As described by the CDFI Fund, the NMTC Program permits taxpayers to receive a credit against federal income taxes for making qualified equity investments in investment vehicles known as Community Development Entities (CDEs). These CDEs offer the credits to taxable investors in exchange for stock or a capital interest in the CDE. Because the service areas of many federally qualified health centers (“FQHCs” or “health centers”) overlap these specific census tracts, health centers can often qualify to utilize NMTC investments as part of their capital financing. NMTC transactions typically provide below-market, interest-only loans during the seven year tax credit period; most transactions are also structured so that all or a portion of the original investment amount can become equity to the health center at the end of year seven—in effect, the NMTC portion of the investment does not need to be repaid. New Markets Tax Credit investments are place-based and must be located in eligible census tracts. To find out if a site you have in mind is eligible for this program and to connect with a CDE interested in investing in your area, contact Mark Lurtz at mlurtz@caplink.org. For more information on how health centers can take advantage of this program and the newly available allocation, read our publication “Spotlight on Capital Resources: New Markets Tax Credits” available on our website http://www.caplink.org/resources. Today, President Obama released his FY14 budget proposal detailing his federal spending priorities. Among the many items included, the President proposed to permanently reauthorize the New Markets Tax Credit (NMTC) program at an annual amount of $5 billion. This represents another show of support for the NMTC program, which has helped many Community Health Centers generate additional equity for their projects. The NMTC program is slated to announce a new round of allocation credits later this month. Contact Capital Link today to learn more about the program and how it may benefit your health center’s capital project. For more information about the program and to learn how it works, health centers and PCAs can access Capital Link’s recently released Spotlight on Capital Resources: New Markets Tax Credits here: http://www.caplink.org/resources/publications. Capital Link is continuing our series of webinars for health centers and PCAs this spring. These webinars have no charge, but participation is limited to the first 100 registrants. Register today! Contact Joe McKelvey at jmckelvey@caplink.org or 202-331-4602 with any questions. Click here to link to our registration form! Last week the Senate and House voted to pass the Consolidated and Further Continuing Appropriations Act of 2013, which funds the federal government for the remainder of fiscal year 2013. Under the legislation, the Health Centers program will receive a total programmatic level of nearly $3.1 billion for FY 2013. This allocation represents a $300 million increase in funding from FY 2012. Of that $300 million, $48 million is allocated to base grant adjustments for existing health centers to ensure they are able to keep up with rising costs in the health care marketplace. More importantly, the legislation ensures the entire $300 million funding increase will be used immediately to address the demand for access to primary care services that health centers deliver, and provide for the expansion of care to 1.5 million new patients. Part of this funding may also be used to offset the impact of the sequester on existing health centers – ensuring no current services will be cut this year. The legislation will allow health centers to expand access to primary care services nationwide in a time where demand is far outpacing current capacity. During the last expansion of health centers in FY2011, over 500 communities submitted applications for new Health Centers and were unable to be funded. Existing health centers have also not received a base grant adjustment since 2009. The Consolidated and Further Continuing Appropriations Act includes nearly $1.6 billion allocated for health centers in FY13, which would be in addition to $1.5 billion previously allocated under the Affordable Care Act (ACA) for the program. Of the total $3.1 billion allocation, $48 million will go towards base grant adjustments for existing health centers. This represents a 1.7 percent funding increase for existing health centers. The funding for health centers within the ACA is scheduled to end in fiscal year 2015. After Three Years: What is the Impact of the Affordable Care Act? "Never base your budget requests on realistic assumptions, as this could lead to a decrease in your funding." This week House Republicans and Senate Democrats released competing budget blueprints for federal spending over the next ten years. President Obama’s FY14 budget will also be released shortly. In the weeks to come, you will certainly be hearing from both sides about the respective short and long-term merits of their proposals. Although the two plans are quite different, they share a common thread—neither effectively addresses the national debt. Despite how the short-term funding fights are ultimately resolved, even the rosiest long-term plans promise to eliminate the annual budget deficit over ten years. Between now and then, we’ll continue adding to our $16+ Trillion national debt. This reality means the pressure will be on squeeze the federal budget further and further. Although discretionary spending gets the lion’s share of attention, the major entitlements (Social Security, Medicare, and Medicaid) soak up the bulk of federal spending. · Evaluate your finances and balance sheet. Conduct a sensitivity analysis to evaluate the impact of the possible changes to your health center’s funding streams, and develop a capitalization plan to ensure you have a sufficient cash “cushion” to weather the changes on the horizon. · Examine your market to determine opportunities for growth in light of new health insurance exchanges and/or Medicaid expansion. · Develop and implement a strategic plan for growth that includes an operational and program and staffing plan. · Develop an outreach plan for connecting to the newly insured population, as well as a plan to assist your currently uninsured patients in navigating their new insurance options. · Consider beefing up your development and fundraising efforts for ongoing support as well as capital support. Implementation of the Affordable Care Act (ACA) is proceeding as states and communities across the nation make key decisions about Medicaid Expansion, the Insurance Exchanges and Accountable Care Organization development. Below is an overview of some of the latest resources available to track progress. Recent weeks have seen a lot of movement on the Medicaid Expansion front. Newly expanding states include Florida, New Jersey, and Ohio while Wisconsin has announced that it will reject federal dollars but has a plan to decrease its uninsured population by half. On the “No” side, North Carolina lawmakers recently voted to bar the Medicaid expansion, as did Pennsylvania’s governor, although recent news suggests that the governor may be having a change of heart. The National Academy for State Health Policy (NASHP) has developed an excellent overview of ACO development at the state level. Focused on ACOs that incorporate Medicaid or CHIP populations, the map is a good place to start to learn more about how different states are approaching ACO development and implementation. At Capital Link, we are also doing our best to track ACA adoption and progress and share best practices with health centers and Primary Care Associations. Feel free to contact us for more information.